Feast. 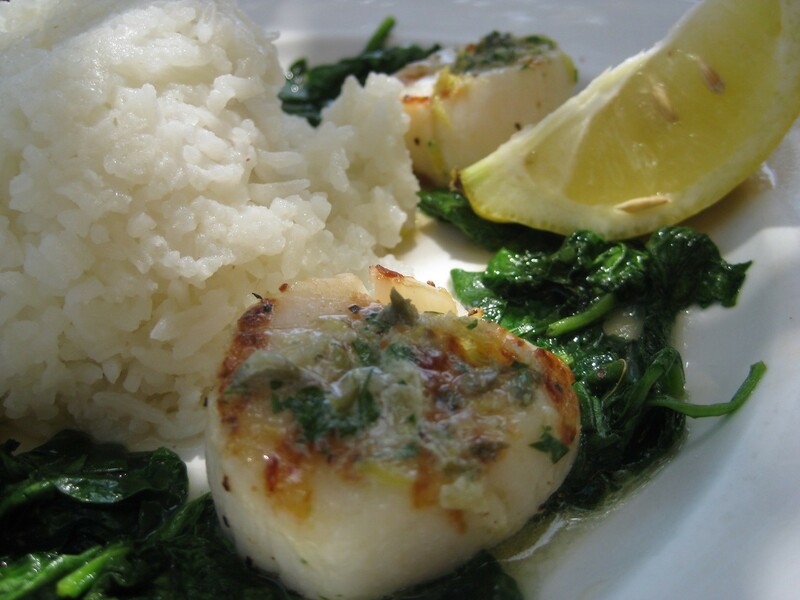 Olive-oil seared scallops with wilted spinach and sticky rice. I was down in San Diego for my sister’s white coat ceremony, so before I headed down to the ceremony, I had to get brunch. I ended up yelping a quaint little place called “The Cottage,” which was known for its super fancy yet delicious brunch options. I opted out of the usual omelet, and instead, went for the lunch special, which was a simple seafood dish with spinach and rice. Pretty darn simple, but done right. The sear on the scallops was legendary, the spinach and rice were perfectly seasoned, and a drizzle of peppery olive oil provided the backdrop to the whole shebang. Good stuff. The simplicity of the dish was very appealing to someone of my personality. When a dish is presented in such a minimalistic way, there’s no hiding poor quality or technique. When there’s no sauce, no use of the food processor, and only enough natural ingredients to count on one hand, it’s imperative to first, start with the damn-freshest ingredients one can source, and second, cook them perfectly. In both cases, The Cottage got it right. Sometimes (more often than not) less is more. That being said, I’m not an olive oil expert by any means, but the drizzle of olive oil I had on my plate was pretty peppery, and I found it a bit astringent on the back of my throat. One might think that this is something that would incite protest, but in actuality, it’s a sign that your olive oil is of high quality. Like any taste, olive oil simply needs to be balanced, like any use of any bitter herb or spice. Luckily, they provided a slice or two of lemon on the side, so a squirt of that provided a perfect balance of peppery, acidic, and sweet (scallops). Contrary to most assumptions about olive oil, buying imported olive oil from far-away countries like Italy, Spain, or Morocco may sound decadent, fancy, and over-indulgent, but from what I have learned, buying local is always better. Yes, I mean buying California olive oil made from olives grown in…California. This ensures the least amount of distance traveled for your precious olives to processing, and again, the least amount of heat-shaking-light exposure to your olive oil from all the way overseas. That being said, buy domestic, local, and in dark bottles to prevent oxidation. A taste test would be the most reliable way to determine the quality of your olive oil, but many people, including me, are not walking experts on olive oil (kind of getting into the similar fringe realm of wine tasting). Best bet would be to hit up your local farmers market, ask for some samples, ask for some knowledge, support them by grabbing something they recommend, and armed with that knowledge, apply it yourself to future bottles of olive oil you may wed yourself to. However, you should still be aware that tasting high-quality olive oil can vary dramatically from grower to grower and bottle to bottle. This is currently my favorite olive oil. The oil comes out a greenish-yellow. 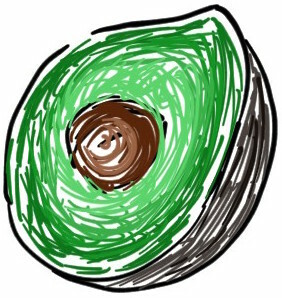 Superbly fresh. There’s a wide array of information, science, and controversy about olive oil here. Read up. After buying your legit, quality sourced olive oil, you can perform some tests to make sure you’re not getting totally ripped off. One quick, reliable test to see that you’re not getting a blend is to stick your bottle of olive oil in the fridge. Most olive oils have been adulterated with polyunsaturated seed oils (sunflower, soybean, safflower, canola oil) that remain liquid at colder temperatures. Real olive oil is around 75% monounsaturated oleic fatty acids, which solidifies around 40 degrees Fahrenheit. If it’s pure olive oil, it should solidify. I sourced that trick here; one of my favorite sites. I generally wouldn’t use extra virgin olive oil to cook with, but rather, would utilize it in raw vegetable salads or just a glug over a finished meal. The flavor profile is much stronger, and the flavor compounds aren’t degraded by high-heat cooking. Of course there’s nothing wrong with using olive oil in general cooking applications, but why buy high-quality oils and not taste them for what they are?